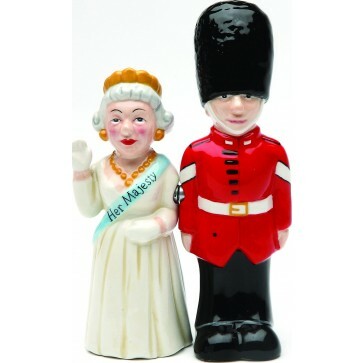 Queen & Guard Ceramic salt and pepper shakers. Height 3 3/4". Queen Elizabeth II said "I have to be seen to be believed" She the Royal Queen of England & UK Guard 3.75" Ceramic Salt & Pepper Shakers on your table! Features a magnetic insert to hold the two shakers together.